I put down and categorized some link baiting tips for you — hope they′ ll inspire you to make link bait for your particular site. Go through this list — and I′ m sure you′ ll come up with great ideas of your own. News are great — when something′ s in the mind of everyone or is about to be so, that′ s your chance to get some links. 1. Write useful comments on something that is happening. 2. Make a compilation of news stories on a theme. Add a little analysis in there, and you′ re good to go. 3. Make an interview with an authority in your niche. 4. Blog about important events in your industry and take pictures when you are on an industry event. Even if you′ re not the only one, you′ ll get a lot of attention. If you are interested, here′ s a comprehensive guide on live blogging — http://www.hongkiat.com/blog/complete–guide–to–live–blogging/. 5. Write an interesting article on a topic important in your niche. And, besides becoming an industry leader, you can attract a few links. Millions of people go online to get a bit smarter. They need to do milliards of tasks that require loads of knowledge. So feed these guys hungry for knowledge, and they′ ll give you links. Want some ideas? 6. Make a special report on some field related to your niche. 7. Write a "History of something–related–to–your–niche" — this can be an e–book or an article. 8. Write a "How–To" guide for your market. Showing people how to do something is extremely helpful. However, if you decide to create such a guide, don′ t forget to keep it up–to–date so that it does not become stale in a couple of months. 9. Gather and analyze statistics — people love stats. 10. Write a "Mistakes to avoid" article for your niche. By nature, people are afraid of making errors, and will surely look through your warnings. 11. Create a case study. Real case studies with real results and the description of methods that work will definitely catch attention. If there′ s something you′ ve successfully implemented — tell the world about it and people will share it. 12. Create a glossary of terms. Not everyone in your industry knows all the jargon being used. If you create a glossary of industry terms and acronyms, you′ ll do somebody a huge favor. 14. Run webinars. Check HubSpot′ s Webinars page at http://www.hubspot.com/marketing–webinars/, with a thousand of inbound links from 140 root domains. 15. Make a free tool that others can put on their sites but that links to you. It should not necessarily be complex. If it can save someone a couple of minutes, it′ ll be used and shared. 16. Offer scripts for webmasters, WordPress and Drupal themes to use freely. Note that the theme should be used by sites with relevant content. For example, if you′ re a travel blog, create a travel theme. 18. Offer plugins and extensions. 19. Create a Facebook application and maintain it over time. Everyone who′ s using this application is practically linking to you. 20. Create icon sets. If you don′ t know design, you can hire someone to do that for you. Then give it away in a new blog post, and don′ t forget to notify design blogs about it! Be the first to do something — and write about that. Flying to Mars would be great of course, but there′ re more down–to–earth things that haven′ t been done yet. 22. Be the first to write the latest news in your niche. This is tough; but still, there′ s a chance that once you′ ll hear someone talking about something new, so don′ t miss it! 23. Test something new — and write about it, make a video, or take pictures. 24. Research and document something that no one researched before — good if your research topic is relevant to your niche, of course. 25. Write a review of something new. If you′ re the first to do that and if it′ s useful, it′ ll get attention and, consequently, links. Besides, this is a sure way to gain favor with the creators of the product or service you′ ve reviewed. 26. Run a newsworthy ‘event′ such as a contest and set an award for it. By asking your participants to write about the contest and link to it, besides links you′ ll get wider coverage. 27. Create a quiz, test, or another way users can measure themselves. At http://www.okcupid.com/politics you′ ll find an example of a 2008 politics test by OKCupid, which attracted tons of links. 28. Ask users to give you input or opinion on a given topic. People may well wish to link to their own comments — sitting on your website. 29. Make an online game — users will be playing and most likely inviting their friends to join. Besides, if you make it embeddable, other webmasters may put it on their sites with a link to you. See what Travelpod did with their Traveler IQ Challenge at http://www.travelpod.com/traveler–iq. Who doesn′ t like humor? Or who doesn′ t want to tell another friend the joke half the office is laughing at? Or is there an Internet user who never watched a single funny YouTube video? Humor creates the mood, lets us get links, and helps us make sales. 30. Make a funny video and upload it to YouTube. 31. Make funny images — they′ re much easier than videos to produce, and can generate a lot of fun. Don′ t forget about memes, which are extremely popular today. 32. Write a funny story. 33. Use satire: make fun of industry figures, leaders or political personalities (but be careful not to overdo!). Controversies work as high–class link bait. Maybe because human mind is seeking harmony? Or because everyone is likely to be proving their point of view until their rivals give up. Who cares about the reason, as long as you′ re getting links? 34. Write on a very controversial topic, to strike up a discussion between supporters and those who disagree with your views. 35. Take a contrary viewpoint to a hot topic or recent posting in other sources — you may end up getting a lot of links (and a lot of angry responses LOL). 36. On the same theme in someone else′ s blog, post "Why <blogger name> is WRONG about..."
37. Every industry has its own myths. Write a story that kind of demystifies some things to get some serious attention. Make something that just looks good. I′ m not saying you should paint another Mona Lisa (though who knows? ), but there are things that online community may adore. 38. Make interesting pictures, flash movies or images that are just good to look at. 39. Use a cool and unique design for your website. 40. 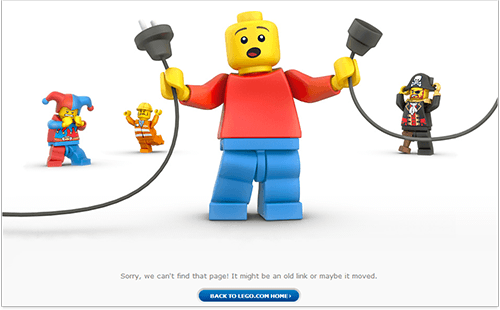 Create a funny and one–of–a–kind 404 error page. Below are some examples to inspire you. 41. Create infographics. Cool infographics not only help people easier digest lots of data, but can also attract links, especially when you make your infographic embeddable. Try helping others, or taking care of environment — besides just doing good, you′ re getting promoted. 42. Help animals and boast about it. 43. Ask your users to donate to someone badly in need of money. 44. Start a green initiative of any kind. 45. Run an outstanding blog on your niche themes. A non–commercial blog will often attract more dedicated users than your commercial site. But from your blog, you can send good traffic to your main website. 46. And one more thing — simple as it is. You can just ask people to spread your idea and tell friends about your webpage. Create a "Tell–A–Friend" page on your website. It works! After you made a list of some useful tips, like this one — don′ t forget to invite your visitors to bookmark and share this list. But again, I have to warn you. While thinking of "link bait" don′ t forget about the real purpose of your website and the value it′ s supposed to bring. Do not overdo — you don′ t want your site to be an online circus arena. DO IT NOW! Create unusual content that can be stunning and attention–grabbing: either extremely useful or very funny and entertaining. Think of something unique that people will like to pass on to each other and link to. And great tips. Your hard work. Controversy Tips can create success, but you have better control debate. The "38 Hints For A Million Link Baits" has some great tips. BTW-List tips are great and people usually love them. I dont have words for this ocean of experience from you.